One by one, I carefully sort, fold and put them away – onesies, pants, tops, bodysuits, dresses, tiny baby shoes – carefully straightening out edges and lovingly smoothing out folds. They grow so quickly – don’t they? Here’s the matching set we brought her home in. Here’s the dress she wore the very first time we took her to church. Here are her very first baby shoes. Each item has a memory (or five) tied to it – some documented; others not. It’s just stuff, I think to myself. But really, it’s so much more than that. She’s already seven months. She’s only seven months. Only or already? Speaking of documenting, I suppose most mothers have two sides to them, each one continually battling against the other. 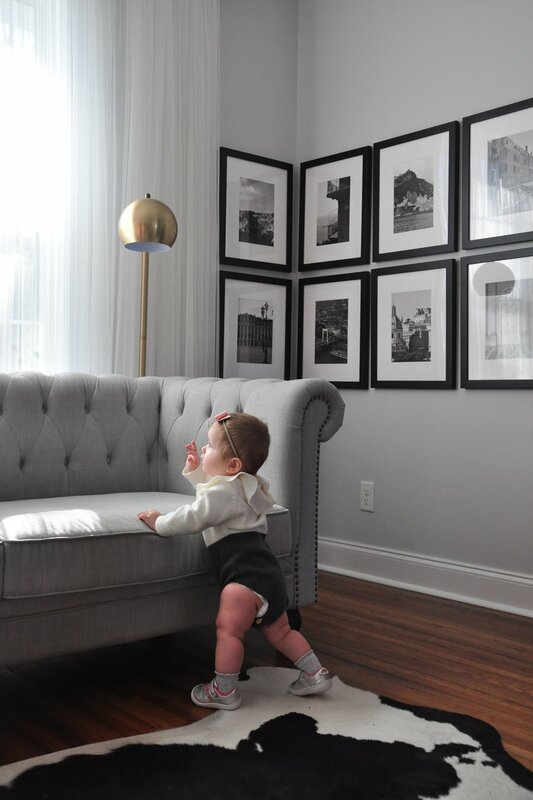 One side is determined to capture every fleeting moment, baby’s every first – from the most obvious of milestones like her first steps to those elusive ones that will surely be forgotten unless captured on camera, like the exact way her blonde hair is matted on the back of her head when she wakes up from a nap. Then there is the other side: the one, in my case, completely overwhelmed by the sheer number of photos in my camera roll – 7,138 to be exact. Surely being present in the moment is more important than documenting it. Surely those milestones are valuable even if – or possibly because – they’re not captured in feeds. Am I capturing enough? Am I documenting too much? It’s a random Tuesday afternoon. Mila and I are visiting the grandparents. My mother takes her under the arms and lo and behold, step by step, for the first time ever, ladies and gentlemen, Mila is walking across the room. Of course, neither my phone nor my camera are within reach. We’re wandering around Target yet again – the unofficially official hang-out place for mothers across the U.S.
After you put away the old, you must bring in the new, right? So, we’re picking out new shoes – shoes in which she, quite possibly, may take her first independent steps. Hopefully I’ll have a camera on-hand to capture that one. We settle on the “Solana” sneaker from Stride Rite – super cute in shiny silver punctuated by pops of pink. 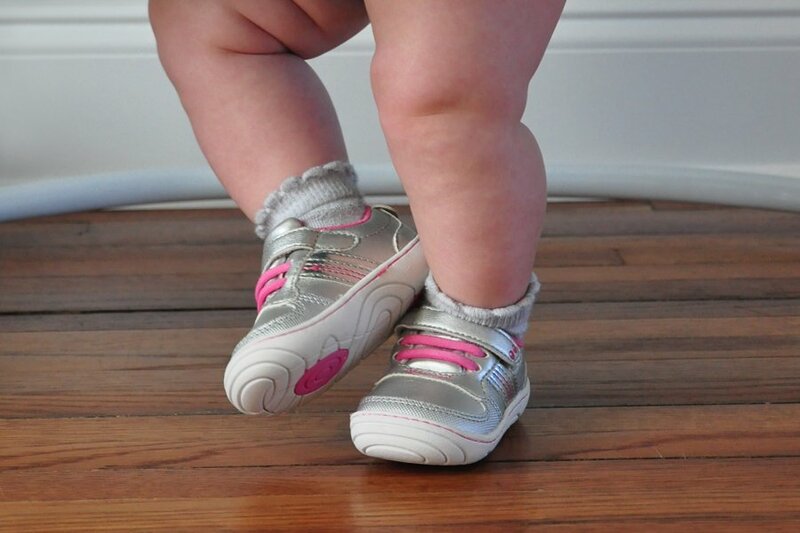 But more than that, the shoes are super flexible, durable and just right for her chubby feet. The rounded toes and traction pods are designed to reduce falls – perfect for a first-time walker. But also, they’re so much more than that. Stride Rite has been preparing little feet for all sorts of adventures since 1919, so you know they know what they’re doing. 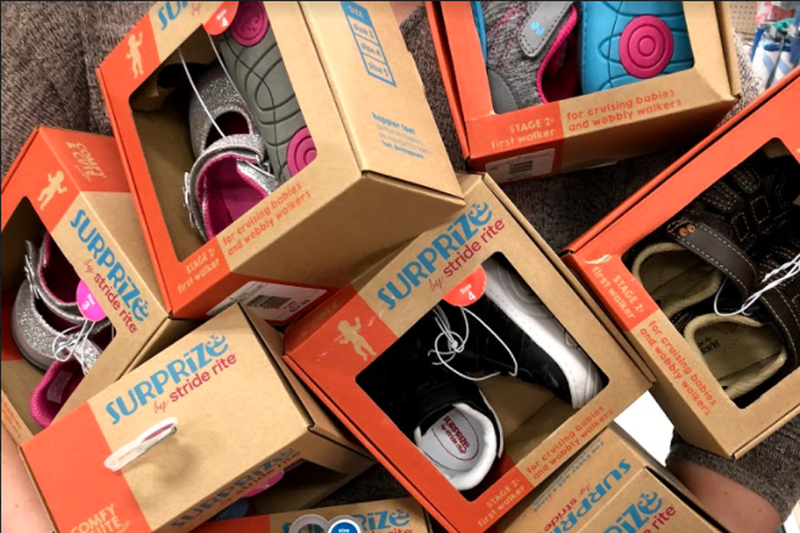 Surprize by Stride Rite baby shoes are available at your nearest Target, as well as online. Thanks for supporting the brands that make FOXYOXIE.com possible. :) This post was so cute, I’m going to share with some friends. My own daughter is graduating college this spring, you just don’t know how fast it will all go!! I’m so glad too to see companies like this making more offerings for parents. I remember back in my day options for toddler shoes were few and far between.